Even with Josh Allen’s (a potential top five edge defender from Kentucky) decision late last week not to participate in the Senior Bowl, there are still a number of edge rushes at the Senior Bowl who could garner first-round consideration. ESPN’s Todd McShay has Mississippi State defensive end Montez Sweat as his 21st-best player on his big board, while The Athletic’s Dane Brugler has him ranked 17th. At 6-6 and 245 pounds, Sweat used his superior length to finish the 2018 season with 11.5 sacks and 14 tackles for loss. He played at both right and left defensive end, primarily as a pass rusher from a three-point stance. 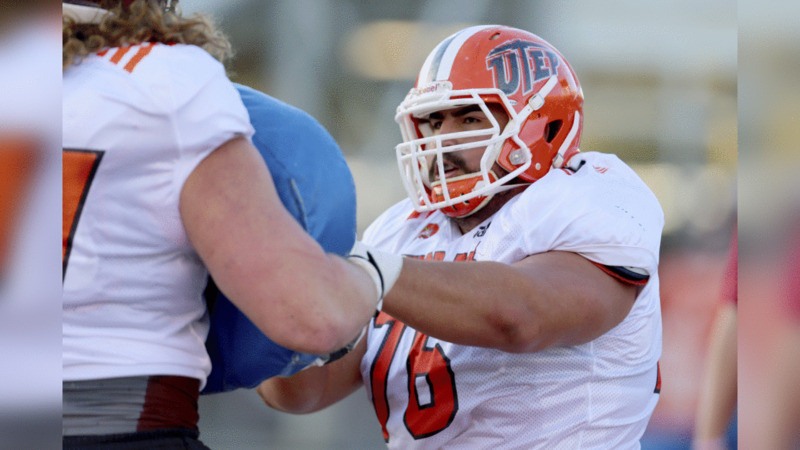 ESPN’s Mel Kiper Jr. has small school pass rusher Oshane Ximines as his 19th-ranked player in the draft. He mostly stood up as a pass rusher for Old Dominion and finished with 18.5 tackles for loss and 12 sacks in 2018. The Senior Bowl will be a huge opportunity to show what he can do against Power 5 competition. He did have success against Virginia Tech on September 22 with two sacks. Ximines is listed at 6-4 and 255 pounds. Last year, Jaylon Ferguson led the NCAA with 17.5 sacks and 26 tackles for loss for Louisiana Tech. At 6-5 and 262 pounds, he played on both ends of the line in a two and three-point stance. Ferguson had a sack and forced fumble in his September 22 game at LSU, but like Ximines, he can use the Senior Bowl to show scouts and NFL teams what he can do against Power 5 Conference level athletes. Ferguson is McShay’s 30th-ranked player in the class. McShay has Boston College defensive end Zach Allen at 22 on his Big Board. Allen had 6.5 sacks and 15 tackles for loss this season and checks in at 6-5 and 285 pounds. He is a bigger body and not your typical twitchy, bend the edge pass rusher. Last year, Baker Mayfield and Josh Allen showed what they can do at the Senior Bowl. While the top overall pick in the draft may not be at the game this year, that doesn’t mean there might not be a first round pick or two playing quarterback in Mobile this week. Kiper has Duke quarterback Daniel Jones rated as his 20th player on his big board, while Brugler has him ranked 28th. Jones is only a junior, but graduated early so he was extended an invite to play in the game. He played for quarterback guru David Cutcliffe at Duke where he threw for 2,674 yards, 22 touchdowns, and nine interceptions as a junior. He doesn’t have amazing tools but knows how to play the position. Brugler of the Athletic has Missouri quarterback Drew Lock as the 32nd-best player in the draft class. Lock played in 13 games and threw for 3,498 yards, 28 touchdowns and just eight interceptions. He has a big-time NFL caliber arm and can make all the throws, but wasn’t asked to make calls at the line of scrimmage or read both sides of the field in college. Both Brugler and Scouts Inc. have Will Grier from West Virginia, in their top 50s. He was extremely productive in his senior season, throwing for 3,864 yards, 37 touchdowns, and just eight interceptions. He will likely be a day two selection. Brugler has Delaware safety Nasir Adderley as the 21st player on his board, while The Draft Network projects him somewhere between 15-30 in their rankings. Playing in the FCS, few people outside of team scouts have seen Adderley play, but he might have people running to the internet to find more video of him after the Senior Bowl. With cornerback experience, he has good range and projects as a coverage safety. Mississippi State safety Jonathan Abram is 28th on McShay’s big board and profiles as more of a strong safety. He gets downhill and attacks as a big hitter closer to the line of scrimmage. The Senior Bowl will give him a chance to show off his coverage skills. There’s one more small school sleeper to note at the Senior Bowl: Cornerback Rock Ya-Sin. He only played one year at Temple after transferring from FCS Presbyterian College in January of 2018. He finished last season with two interceptions and 12 pass break-ups. He is Brugler’s 45th-best player and could open some eyes in Mobile.